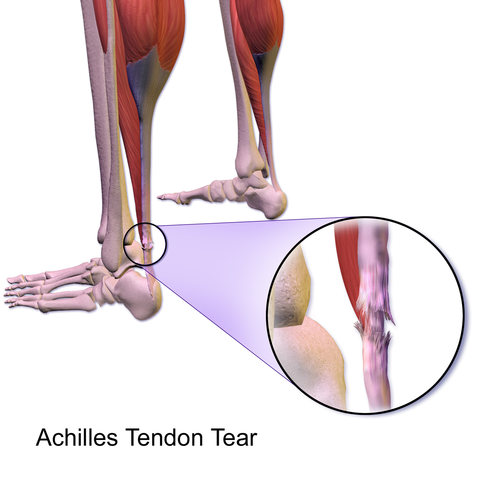 A complete tear of Achilles tendon tends to occur in middle aged patients. Partial rupture occur in trained athletes and involve the lateral aspect of the tendon. Acute tear of Achilles tendon commonly result from acute eccentric overload on the dorsiflexed ankle that has chronic tendinosis. Patients should be questioned about previous steroid injections and fluoroquinolones (possible link with tendon weakening). Rupture most commonly occurs in the middle-aged male athlete. As one age, the Achilles tendon weakens and become thin, making it more susceptible to injury. Sharp pain and "pop" heard at the time of complete tear are commonly reported. Patients often describe a sensation of being kicked in the Achilles tendon.A gap or depression may be felt and seen in the tendon about 2 inches above the heel bone. Most have an immediate inability to bear weight or return to activity. Partial rupture is associated with an acute tender, localized swelling that occasionally involves an area of nodularity. The Thompson test is positive with complete Achilles tendon rupture. The patient is placed prone, with both feet extended off the end of the table. Both calf muscles are squeezed by the examiner alternately and compared. If the tendon is intact, the foot will plantar flex when the calf is squeezed. If the tendon is ruptured, normal plantar flexion will not occur (positive test sign). In some cases, an accurate diagnosis of a complete tear is difficult through physical examination alone. The tendon defect can be disguised by a large hematoma. A false negative Thompson test may also occur because of plantar flexion of the ankle caused by extrinsic foot flexors when the accessory ankle flexors are squeezed together with the contents at the superficial posterior leg compartment. Partial ruptures are also difficult to accurately diagnose, and MRI andUltrasound should be used to confirm the diagnosis. Both conservative and operative treatment treatments are used to restore length and tension to the tendon to optimize strength and function. High level and competitive athletes undergo primary repair. Operative repair is associated with lower re-rupture rates, quicker return to full activity and a theoretically higher level of function. The main operative risk is wound breakdown. Surgery should be avoided in patients with poor wound healing potential (diabetics); smoking is relative contraindication. Nonoperative treatment of complete Achilles tendon tear in a 20 degree plantar flexed cast is usually reserved for chronically ill patients, poor operative candidates, elderly patients and low demand patients. The re-rupture rate is much higher in patients treated non operatively. Non operative treatment for poor operative candidates requires immobilization for hematoma consolidation. A 20 degree non weight bearing plantar flexed short-leg cast or a removable boot with an elevated heel is used for 8 weeks. The patient remains non-weight bearing in the cast for 8 weeks. At 6-8 weeks, plantar flexion of the cast is slowly decreased. An initial heel-lift of 2-2.5 cm should be worn for next one month when progressive weight bearing is begun. Gentle non-weight bearing active ROM (range of motion) exercises and gentle passive Achilles tendon stretching with rubber tubing are begun. At 10-12 weeks, the heel-lift is decreased to 1 cm and, over next month, is progressively decreased so that the patient is walking without a heel-lift by 3 months. Achilles tendon exercises- Progressive resistance exercises for calf muscles should be started between 8-10 weeks. Running may be resumed after 4-6 months if strength is 70% of the uninvolved limb. Operative treatment is preferred for young, athletic, and active patients. The incision and approach are the same as for paratenonitis and tendinosis. A padded 20 degrees equinus posterior splint with plaster ankle stirrup initially postoperatively. Non-weight bearing with crutches for 4 weeks. Progress to partial weight bearing with crutch assisted ambulation in a short leg fibreglass cast. Initially use cam boot with 15 degrees of plantar flexion dialed in. Active non-weight bearing ROM exercises can be started as early as 7 days after surgery. Incision must be well healed before initiation of exercises. Initial exercises consists of very gentle passive plantar flexion and active dorsiflexion limited to 20 degrees, 2 sets of five, 3 times a day. At 1 month, start to slowly bring ankle towards neutral by decreasing the heel-lift in the boot by 1 cm. Wean out the heel-lift over 6-8 weeks period. Use walking boot for 6-8 weeks, then make transition to normal shoes when using the smaller heel lifts. Stationary bicycling (no resistance) and swimming initiated at 6 weeks. Gradual return to competition as in conservative treatment. Must have full strength and full endurance and have completed the running program. Use short-leg non-weight bearing equinus cast for 6-8 weeks followed by 1 cm heel lift in a removable boot for 1 month. Progressive non-weight bearing resistance exercises are started at 8-10 weeks. Stationary bicycling and swimming at approximately 8 weeks. Return to some athletic activity at 5-6 month if strength is 70% of the uninvolved leg. Generally, return to full level takes 1 year, can take up to 18 months.